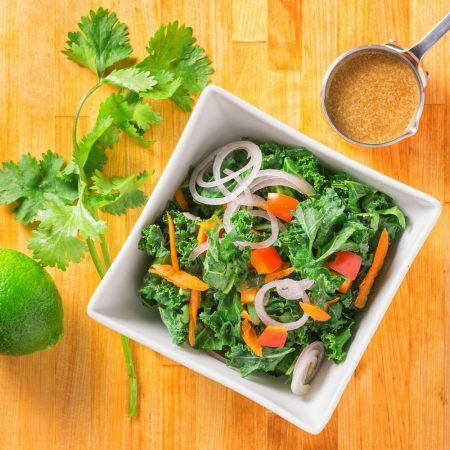 Massaging the kale and a bit of tahini and honey in the dressing are the secrets to this healthy asian kale salad. A big handful of cilantro lends a nice bright note. Other than massaging the kale it’s easy enough. Grate some carrot, chop some red pepper, slice some shallot and chop some cilantro. Mix up a simple vinaigrette and you have an easy asian kale salad. It’s even healthy I suppose. You can play with this recipe to match whatever looks good to you. Green onion, edamame, mint, green chilies, sunflower seeds. Whatever you want. Massage your kale and toss with this simple vinaigrette for a refreshing kale salad. Use a sharp knife to remove the tough stems from the kale and discard. Chop the kale into small pieces. Add a bit of salt, mix and grab a handful of salted kale. Rub between your hands until the colour turns noticeably darker. Put the rubbed kale into a different bowl (or back onto the cutting board). Grab the next handful and repeat until all the kale has been massaged. Return kale to the bowl if it's on the cutting board. Spoon the tahini into a small bowl, add the rice wine vinegar and stir to combine. Add the soy and sesame oil and stir again. Incorporate the remaining dressing ingredients. 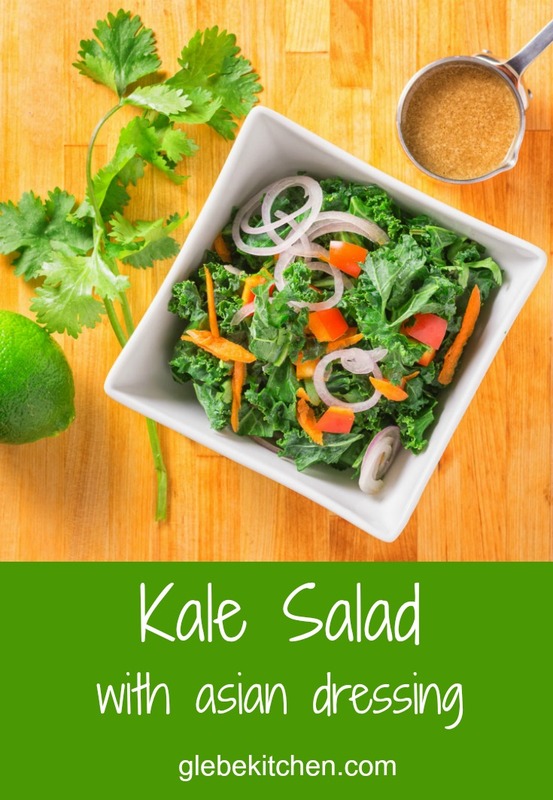 Mix the kale with the rest of the salad ingredients, toss with vinaigrette and serve. This asian kale salad is quite sturdy and will keep for a few hours if needed. In appetizer, salad. Bookmark the permalink.